Needs Paragon of Fierce Defiance . 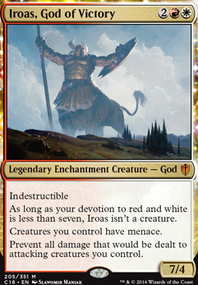 I think you left it out because it gives other creatures haste and you found it redundant, but with him out your warriors are +3/+3. Flamerush Rider . Cyclops Gladiator is more or less a /6 that fights every turn in this deck. Falkenrath Marauders is a good stand-in for Ruttley and Taunton's hot-guy characters. greyninja on Staples for the Xenagod? 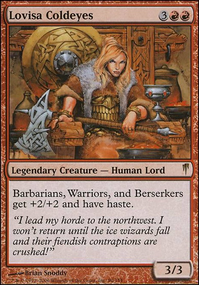 Atarka, World Render hits for 24 w xenagod. Craterhoof Behemoth ends games. Hydra Omnivore is solid. Don't forget to add in a ton of ramp get to get it rippin' and roarin'! Have fun! First strike is a combat ability that only applies in combat. When two creatures fight each other they deal the damage simultaneously, so the only things that can help are indestructible or damage prevention effects like protection. Deathtouch and Lifelink will also be applied, as they function for any type of damage, not just combat. Also, creatures are only destroyed due to damage when state based actions are checked. 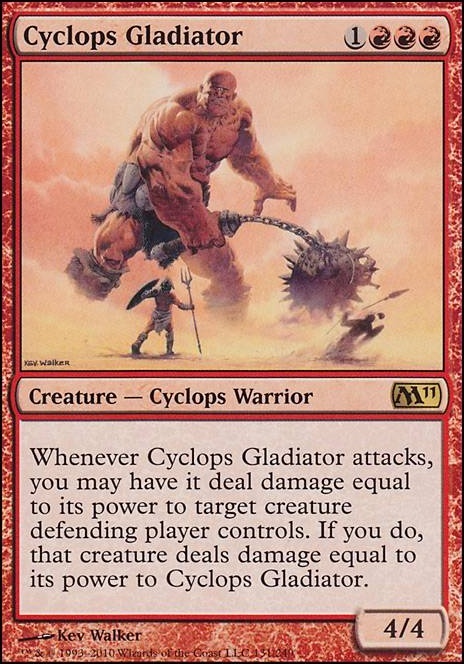 For example Cyclops Gladiator deals its damage before the other creature (unlike fighting), but even if it deals lethal damage, the other creature will still get it's attack in. However, an advantage to this ability over fighting is that if it has wither or infect it will actually decrease the other creatures power before it hits back. Pathbreaker Ibex seems cool. I'll put him in the maybeboard. Indrik Stomphowler and Conclave Naturalists cost too much for what they do. Selvala, Heart of the Wilds seems cool too, will put in maybeboard. There aren't enough targets for Woodland Bellower. Fierce Empath has some potential, so maybeboard. 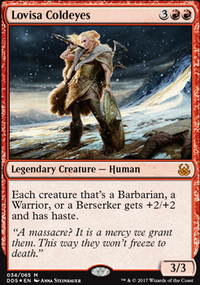 Ruric Thar, the Unbowed doesn't do enough to justify his CMC, same with Gruul Ragebeast and Whisperwood Elemental. Very limited counterspells in meta (shocking, right?) so no need for Spellbreaker Behemoth. 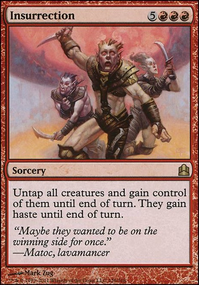 Cyclops Gladiator is nice removal, but 3 red in a primarily green deck is a stretch. Urabrask the Hidden is a great card (I just traded it away :/) and is MUST ADD. Thank you.Stonehoof Chieftain is something to consider, I will need to think about our stonehoofed friend. Fling is funny, but not the best fit IMO.Avatar of Slaughter is SO FUNNY! I am getting this for sure! The 2 worms are blehSteel Hellkite was definitely overlooked. I need to add it in for sure. Zendikar Resurgent seems great, I will add it inSignal the Clans is a great card, but wouldn't it make more sense to get rid of rampant growth before nature's lore?Bower Passage seems interesting but is too limited. I thought of that combo before and it seems hilarious as hell, but not worth running as each piece is weak on it's own. Blightsteel Colossus is great but I'm not a huge fan of infect. I don't mind if someone runs it, but I just don't like it. The Kiki combo is cool and I LOVE combos, but this is the 1 deck I'm trying to make without an inherent "insta win" because I would just tooth and nail those creatures each time. The only infinite combo I have in the deck cannot be tutored for so if it goes off, then it's more "fair" according to my LGS. Summoning Trap is limited but possibly a sideboard card. 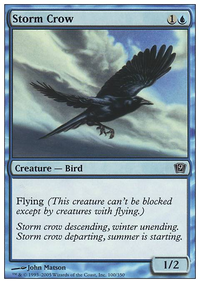 Do you guys know what is a good CMC range for this kind of deck? 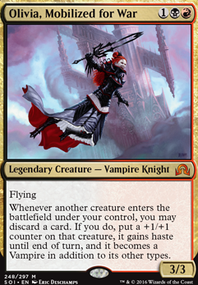 I've always tried to make the CMC of my EDH decks anywhere between 2.8 and 3.4. I know the beaters in the deck skew the AVG CMC towards the higher end, but I am unsure as to what range i should try to fall into. Sorry to comment again so soon, but there's a few cards I forgot to list above. Cyclops Gladiator is another Tyrant's Familiar, in case you feel your removal is lacking. Urabrask the Hidden is a creature that gives all your other creatures haste., fantastic if you need hast, and don't want to run Fires of Yavimaya. Stonehoof Chieftain is a big beater that can't be beat by most removal, or any combat damage. Bit on the pricey side mana-wise, but he'll do you good when he finally reaches the battlefield. Fling is fun if you just need to end out a game and you can't get past their blockers. Or if you need emergency removal. Avatar of Slaughter needs no description. You know why you'd want him in this deck. 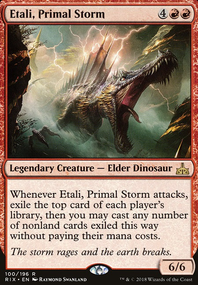 Elderscale Wurm is both a good utility creature, and a decent beater. Give it a go if you want something weird. Finally, Steel Hellkite is fantastic at clearing out enemy tokens/high threat targets as long as you have the mana for it's ability. Sorry for the long posts, but there are a lot of really strong creatures for a deck like this, and I'm hoping you seriously consider including some (if not most) of them.